February is upon us! Where does time go, truly? The older I get, the faster the days seem to fly by. January has been full of action in the shooting world. There has been the Dallas Safari Club Show, The Shot Show in Las Vegas, and now the Safari Club International show in Las Vegas is just around the corner. From all I hear, the first two were a great success. I’ll be attending SCI in Las Vegas and hope to see many old friends and meet new ones there. I always look forward to seeing all the new offerings the shooting world is bringing forth gear, lodges and trips and these shows are a great place to seek them out. I find that February is also a time to look back on some great wing shooting and look forward to more upcoming in the spring. Times in the field with great friends and family, good dogs and some fellowship in the evenings to reminisce about the days in the field are some of my favorite occasions. 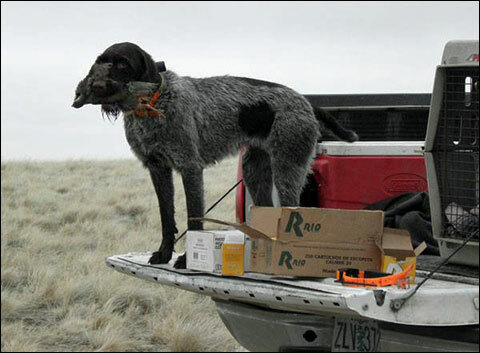 It’s also time to plan for some shooting adventures in early spring and to look ahead and plan into the fall. Featured here are some great folks who have enjoyed some fine wingshooting and some other fun throughout the year. One thing is apparent, that if you love to shoot, you’ll endure the cold, the rain and even the heat! Right now, looking at snow out my window, sunny and 75 is sounding pretty good. Wingshooting can take you to some beautiful places. For me, enjoying the scenery is just as much a part of the whole experience as the shooting itself. It’s all such an integral and beautiful part of the hunt. 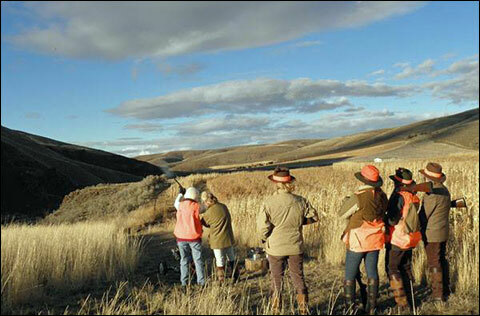 This photograph is captured in Oregon getting a fantastic group of ladies ready for some upland hunting. Gorgeous and willing companions in the field, and not wanting to stop, even when the day is over. 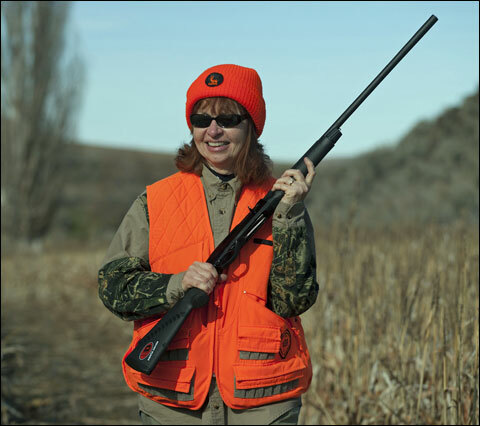 Truly a joyous hunter, Margaret Coffey is walking the field in hopes the dogs will find a few birds. Nothing like the thrill of a first hunt. 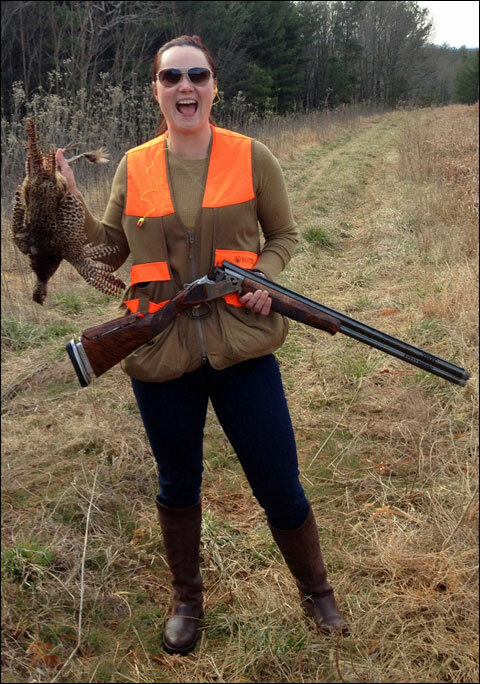 Here’s April Asbury on her first walk-up hunt for pheasants at the beautiful Primland Resort. April is a brand new shooter who got hooked on the sport during her first hunt! We’re not surprised. You can visit the Primland web site at http://goo.gl/4Ww3m5. 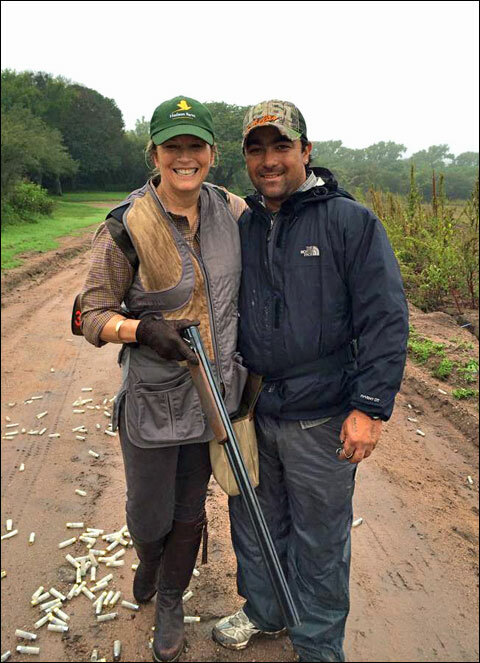 Lyndall Bailye, owner of Good Shot Design, enjoying pigeon shooting in Argentina. A whole new experience working with pigeon decoys. She did great and what fun pigeon shooting is! Lyndall has the look and you can check out her shooting apparel and accessories on the Good Shot Design web site at http://goodshotdesign.com. Women who love to shoot will shoot through any weather. On this trip to Argentina, it absolutely poured one day and in a break, we went outside, slopping through the mud, and shot in the drizzle between downpours. Finally a thick fog slipped and we could hardly see the birds and had to say uncle. Notice all smiles no matter the adverse conditions. Make the most of every moment. There is beauty all around you when in the field if you just take the time to look. One of my favorite all time candid shots showing true enthusiasm and excitement and the sheer joy of hunting. 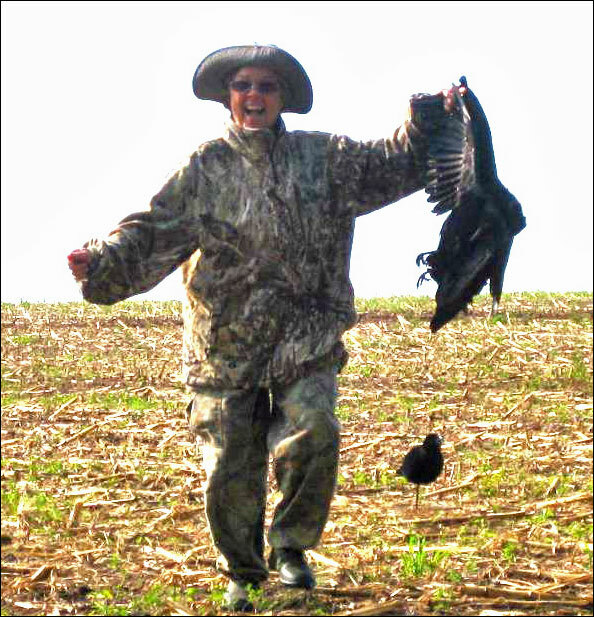 Marge Samuels on her first crow hunt. 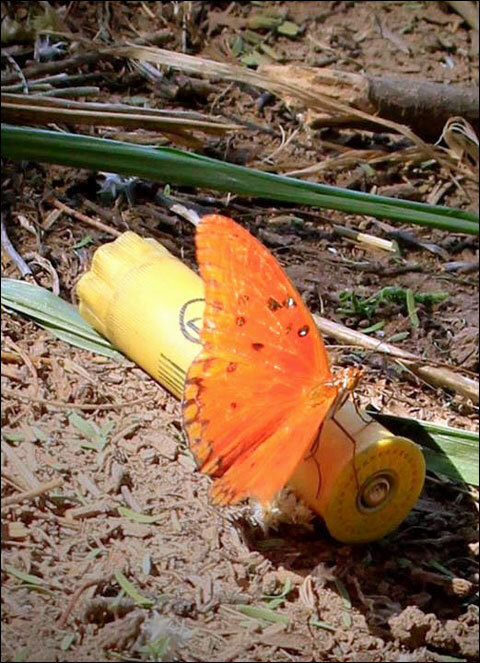 Not everything that flies dies. One day in the fall a few years ago, we celebrated a beautiful afternoon of shooting with the beauty of a hot air balloon. G.R.I.T.S. member and crack shot, retired fabulous lawyer and avid pilot, both of balloons and airplanes, Eva Tashjain Brown, treated the G.R.I.T.S. to a unique perspective of a shooting field. Ya think? Soooo fun! 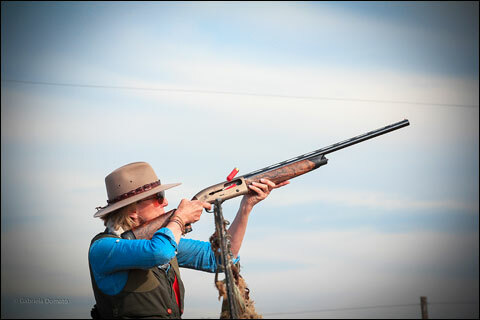 Speaking of the G.R.I.T.S., we have launched our own web site and membership organization, starting chapters for recreational shotgun lovin’ gals! We’re a work-in-progress, having just finished our Guide Book and bylaws and we are here to get you involved and shooting. You can be branded new or a crack shot, you just can’t keep score. That’s not what’s important — it’s all about the fun is. Visit us online at www.GRITSgoBang.org. 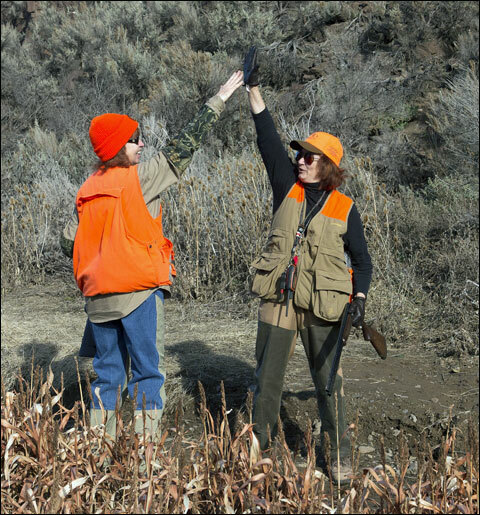 So, grab a friend, get out and practice and plan your next wing shooting adventure. 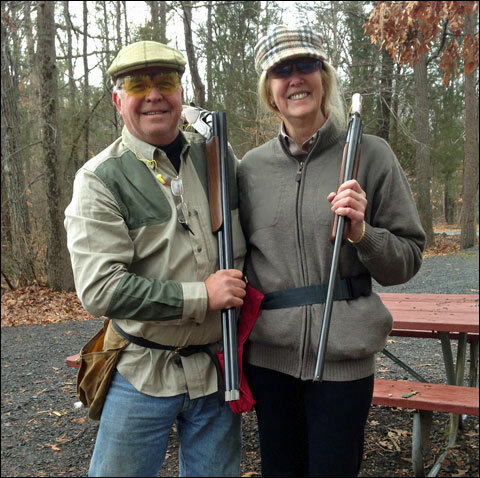 Here are Rick Hammett and Kim Shelly out shooting on a Sunday afternoon for the sheer fun of it!